Which typeface would you snog, marry, avoid? Graphic designer and Type Tasting founder Sarah Hyndman has been finding ways to make typography fun and exciting for a mainstream audience for years. Previous explorations have looked at how fonts taste and feel, but for her new type psychology dating game, What's Your Type: The Type Dating Game, Hyndman has started a conversation using a language we can all understand: the language of love. 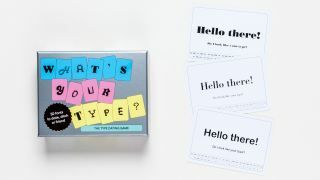 Designed to test how type-savvy you are and to help players understand type in a totally new way, What's Your Type is a new card game from Laurence King Publishing that explains font 'personalities'. Players can choose from four different styles of play, including a typographic twist on the ever-popular 'snog, marry, avoid'. The set includes 50 cards, each featuring a different font. By making a selection, or turning down an unlucky typeface, players find out about what attracts them to a certain style, and even what their choice says about their character. It's a whole new way to think about font pairings. "I started researching type and perception a few years ago," Hyndman tells us. "One of the earliest things I wanted to find out was whether I’m the only person who sees personalities in typefaces, like a weird form of typographic synaesthesia, or whether everybody does." There are, of course, exceptions to the rules. "When I first started to look at the results I was perplexed to see Bauhaus described using words like 'silly, a clown, friendly, doughnuts'," Hyndman explains. "As a graphic designer I associate this typeface with architecture, the art school of the same name and an ideology that inspired Modernist design. I was both mortified for Bauhaus, and worried that somehow the survey results had mixed themselves up." "However, on looking closer, I found that there are some typefaces, like Bauhaus, that might receive different answers from designers and non-designers. As designers, we often hold a typeface in higher regard due to its history, but a non-designer will judge it purely on its appearance." What's Your Type is more than just a fun way to essentially swipe left or right on typefaces though. Each card details the top three personality traits for a font, so they also help designers decide on an appropriate typeface for their project. Speaking about how she turned fonts into dating profiles, Hyndman reveals that she spent nearly a month behaving like a typographic method actor, "I 'got into the head' of different fonts and wrote their dating profiles in what I imagined would be their voices. When I got stuck I found my friends were happy to make suggestions, so this led to a few very funny evenings of smutty typographic innuendos." However, this doesn't mean that What's Your Type is targeted at typography nerds. "I’ve played it with lots of people and it’s the non-designers who really have the most fun," Hyndman adds. "It's great to watch people discover that they have really clear ideas about font personalities, they just might not have realised it. And how they’re delighted if what's written on the card matches their ideas." "What's even more fun is that they get to giggle at us designers while we agonise over the choices of which font to date, ditch or friend — especially if the dates dealt are Curlz, Papyrus and Comic Sans."